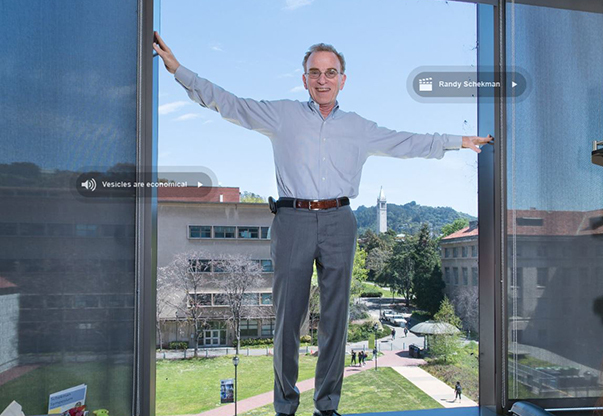 Our newest Nobel Lab 360° features 2013 Nobel Laureate Randy W. Schekman. This virtual tour through the Schekman lab at the University of California, Berkeley, shows you his office, the main lab and the cell sorter. Randy Schekman and his team introduce their current work on how human cells manufacture small membrane vesicles containing RNA molecules. With an animated cluster of yeast, Prof. Schekman explains the research that lead to his 2013 Nobel Prize in Physiology or Medicine with James E. Rothman and Thomas C. Südhof.